November 13th, 2010 was a great night filled with amazing bands and an electrifying crowd at the Klas Rock Show in Cicero, IL. As we start the new year, we want to start off right. It is with great pleasure that I announce that on Febuary 19, 2011 we will be doing it again. As promised, we start off this new year with some great news. As you probably already read, ‘The War Cycle’ is now Available on iTunes for digital download. So do yourself a favor and download yourself a copy today! We spent the majority of 2010 working on ‘The War Cycle’ at Gremlen Studios in Aurora,IL and though it took sometime we are very humble and proud to be able to put our album on iTunes for digital distribution for our supporters. We thank everyone who was involved and those who supported us. Thank You and we hope you’re ready for the next one! Come by later this week for another major announcement. November 25th, 2010 Uncategorized Comments Off on Happy Thanksgiving! Waterlife is thankful for everyone who has been and keeps supporting us in any way, shape or form. Those who’ve supported our vision since day one, and those who have along they way found our music or our message. We’ve come a long way, it has been a great year, and we still have a long way to go. Happy Turkey Day everyone!!! November 22nd, 2010 Uncategorized Comments Off on FREE DEMOS?!?! How do I get my free demo you may ask? To everyone who tuned into the UIC Radio segment, Thank You! To those who didn’t: Check out our Facebook player and catch up! Topics range from MMA to Tequila! Get to know the men behind Waterlife Music by clicking on our facebook link below. Sorry for the delay guys. I can finally say its done! The flyer is ready. The question is now, are you ready? Now go out and promote this! What makes a band “good”? Is it the music? Is it the message? Is it the image? Or is it the outreach to the community around them? Currently Waterlife is taking steps to rebuild the scene through the community, but how does one conquer such a broad task? Where do you start? How do you move up? How do you gain momentum? When is the scene established? Where do you go once it is established? There are many answers to those questions none of which are wrong. Of the countless ways to achieve that ultimate goal, Waterlife has chosen one specific target: KIDS! Are children not our future? So it would make sense to create the future we want while molding young minds positively. One goal that Waterlife has set in its sights is Cicero East. October 21st, 2010 Uncategorized Comments Off on Stay ahead of the news! Check out all of Waterlife Music’s networking sites and get real time updates regarding shows, interviews, videos or any type of Waterlife Music news! So become fans, friends, or follow us if you have to! October 19th, 2010 Uncategorized Comments Off on Waterlife Music and Klas show Nov 13. Waterlife Music and Klas show Nov 13. Hey guys, we are sorry but Waterlife will NOT be playing at Klas Nov. 13th. With all the work that goes into putting one of these shows together the way we do, it’s hard for us to play the same show we are hosting. For those that know us personally I’m sure you will understand. We’ve gone on long rides through these shows. From “Battle of the Instruments”, to “Battle of the Bands”, Q101 commercials to working with Chicago Powerfest. We work very hard to make sure you walk away with the best memories possible. If we would play this event, it would add a lot more to the pile of long to do lists. This isn’t the glory days of 2006 or 2007. The scene has taken a major hit, but its still alive and around. We just need to work extra hard if we are looking to unite it. As much as we’d love to perform for you, we cannot. Instead let us host this event for you. The bands that are on the bill will be more than enough to satisfy your needs. That we can promise. The line up speaks for itself! I’ll have the flyer for you later this week. Just waiting on small details before I can start it. Thank you all in advance for being understanding on the situation. For those of you who tuned in and/or in someway supported us along with UIC Radio a big thanks to you guys! For those who missed the radio show shame on you! Ok we’re just kidding. However, we do have a few segments from the show on our Facebook page so have a listen! 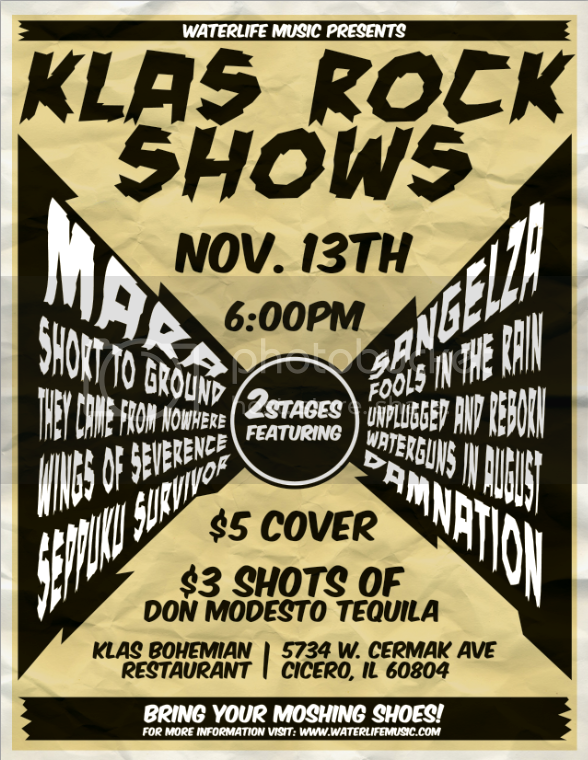 Don’t forget, we will be hosting the show November 13th at Klas brought to you by Don Modesto Tequila! Also, we will be going in to UIC Radio on the 31st of October for an IN DEPTH INTERVIEW!!! Be sure to visit frequently for the latest Waterlife and local music community news!